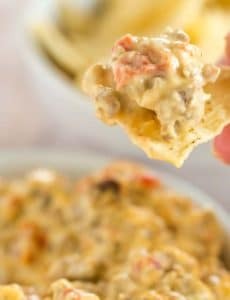 This game day dip is perfect football food - only 5 ingredients and you throw them all in the slow cooker! Spray a 4 to 6-quart slow cooke with non-stick cooking spray. Add the cooked beef and sausage, cubed Velveeta, Rotel and cream cheese, and stir to combine. Cook on high for 2 hours, stirring occasionally, until the Velveeta and cream cheese are completely melted and creamy. Serve with your favorite tortilla chips.